DEFINE body & mind, an established wellness pillar in the community, is supporting its Community Health and Wellness Director, Melanie Baxter, MS, and her campaign for the Leukemia Lymphoma Woman of the Year by hosting Houston’s First Annual Red Party on April 28th from 8 pm until midnight. 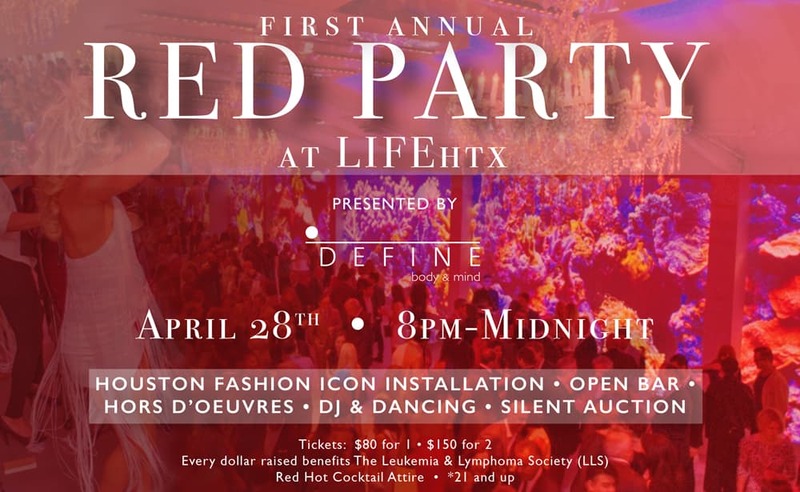 The Red Party benefiting the LLS will be at Houston’s most premier event venue, LIFEhtx. Admission includes complimentary valet, an open bar, unlimited light bites, dancing, and perhaps most impressively, a fashion installation with Houston’s preeminent fashion designers. Jessie Dugan, former lead jewelry designer for Tory Burch and the Smithsonian, David Peck, fashion celebrity, and Leslie Denby (DYI), recently featured as Athleisure’s New It Girl Designer in Forbes Magazine, will be showcasing their latest collections while featuring their shared silent auction donation: an opportunity for one winner to spend time in each designer’s studio and have a custom piece created just for them! Along with this exciting prize, attendees can also bid on silent auction items like a year of unlimited classes at DEFINE, a private party at Pinot’s Palette, a piece of custom artwork by local artist Andrea Simmons, and more! This party is going to be an event that you don’t want to miss! Giving back has never been so much fun! Tickets are $80 each or two for $150, and every penny raised goes directly to the LLS thanks to generous donors like Central Houston Cadillac, Sales Engenuity, and Give Back Recruiting. Tickets can be purchased directly through LLS by CLICKING HERE! For more information, contact Melanie Baxter at 281-928-7454 or Melanie.Baxter@definebody.com.